Zippy stands for Kids. And Parents. Together. Dubai, UAE, September 20, 2018: Award-winning, Portuguese childrenswear label, Zippy, celebrated the launch of its new Fall 2018 collection with an in-store ‘Mummy Morning’ event that took place on the 18th September 2018 in the Dubai Mall. Zippy International Markets Manager, Marcos Fonseca, welcomed parenting media and ‘mummy’ influencers and their kids to a fun-filled event. Guests enjoyed a healthy and refreshing breakfast served up by artisan Australian coffee makers, The Coffee Club, whilst the children took part in arts and crafts, creating personalised t-shirts and bracelets. The mothers and media also participated in a health Q&A session in relation to Pre and Postpartum fitness, led by Pre-Post Natal Specialist, Marie Lueger, from the regions leading mobile personal training company, Urban Energy Fitness. Zippy opened its first store back in March 2004 in Portugal and has since grown into a network of over 100 stores worldwide across more than 20 countries. 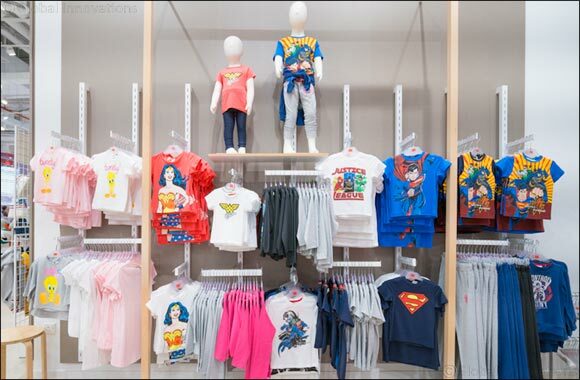 Designed to please the little ones, Zippy has always combined success and quality with fashion and design, offering a wide range of apparel including clothing, footwear, accessories and nursery products for future parents and children up to nine years old, at very competitive prices. The Fall 2018 collection included pieces that are extra preppy, classic and timeless, but with a modern and cheeky twist to meet children’s current tastes and needs. The new collection included three main fashion lines; The School Champions, Heroes, and the Zippy Essentials. The SCHOOL CHAMPIONS line stands out with its everyday practical pieces as casual and sportswear come together to create key items in any child’s wardrobe. This ‘academy’ style is all about denim – with shirts, jeans and skirts - knitwear, joggers, sneakers, hoodies and sports socks. Committed to contributing to children’s full development and success through positive messages, the HEROES collections will feature items alluding to children’s heroes like ‘Wonder Woman’, ‘Superman’, and ‘Batman’. The goal behind this creative line is to foster imagination and creativity, encouraging children to be whatever and whomever they wish to be, which translates into garments with messages such as “be anything you want” or “be the hero”. The ESSENTIALS line includes all that a child might need for the Fall season. The line offers colourful, versatile, and ; shirts and long sleeves for girls; sweaters, long sleeves, and basic checked shirts for boys; and puffers and vests that are the brand’s signature style. Zippy stores are designed to please not only the little ones, but also the parents, who can intuitively find everything for their children in a fun and relaxed environment. Zippy’s mission is to guarantee the wellbeing of every baby, child, and parent, thus contributing to an experience to be enjoyed by the entire family.